Tuesday's Toot - I was on T.V. Yesterday! I haven't particpated in a Tuesday Toot in a long time. Mostly because I've been too pooped to toot! I've been working my tail off getting my farm ready and helping to promote the Alpacas of Minnesota 5th Annual Farm Tour this coming weekend, September 27th and 28th from 10 a.m. to 5 p.m.! Which brings me to my toot for today, I arranged a segment on a popular local television program called Showcase Minnesota to help promote the farm tour for the entire state of Minnesota! On top of it, I got to appear on the program to demonstrate the dropspindle! You can see the video of the segment here. On September 27 & 28, Humming Hills Alpaca Ranch, LLC invites you to join us for the 5th Annual Alpacas of Minnesota Farm Tour. Our doors are open to the public from 10 a.m. to 5 p.m. each day! What is an alpaca? Alpacas are members of the camelid family, which means Llamas and Camels are their cousins. They’re very gentle creatures with a wonderful disposition. 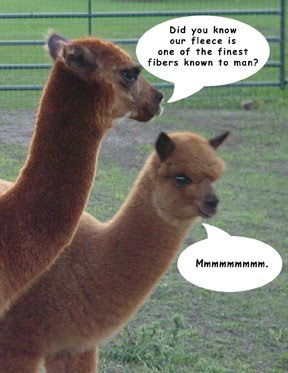 They’re approximately a third the size of a llama and produce one of the most luxurious and strongest fibers in the world. Their cashmere-like fleece is 5-7 times warmer than wool and does not contain any lanolin. For people who have sensitive skin, allergies or cannot wear wool because it’s too itchy, alpaca fiber is the perfect alternative. Alpacas are also the only fiber bearing animal that comes in 22 different natural colors and variations. In addition to educational sessions, children’s activities and fiber related demos (drop spindle and wheel spinning, crochet, loom knitting, needle knitting, and machine knitting, needle and wet felting), Humming Hills Alpaca Ranch, LLC will also be selling alpaca related products, jellies and jams, jewelry, and lots of gift items. There’s something for everyone in the family - raw fiber (used in fly tying), yarn (hand and machine spun) and garments made from alpaca fibers, alpaca toys, make-and-takes, photo opportunities, and more! Come and enjoy the autumn colors, refreshments and the soothing sound of our humming alpacas!